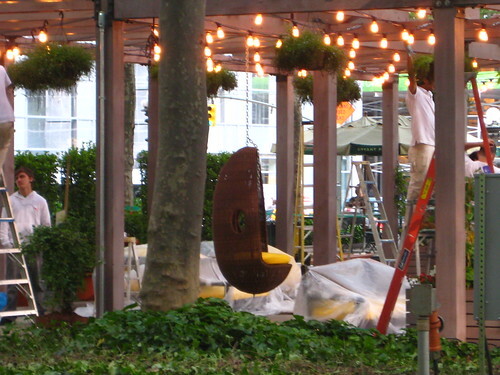 I left work at just the right time Monday evening; the thunderstorm was ending, the sun began shining, people in Bryant Park were being told that they couldn't sit on the grass and watch the night's movie which gave this schadenfreude joy, and I noticed something new being installed in Bryant Park. "What could THIS be? It looks like summertime romance." Diner's Journal and Eater gave me the answer yesterday. 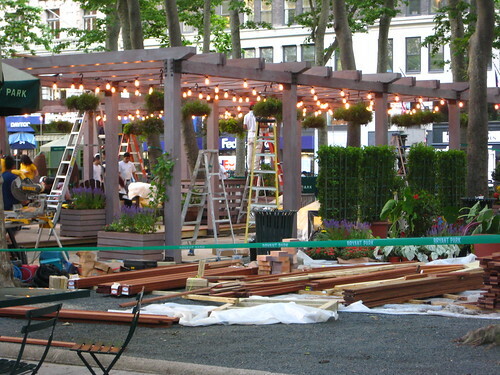 This very Friday, 'wichcraft officially takes over the entire 6th Avenue side of Bryant Park when the current trifecta turns into a superfecta with The Southwest Porch, a pop-up cafe sponsored by Southwest Airlines. Unlike the three kiosks that currently reside there, The Porch will have 175 seats, a bar, porch swings, Adirondack chairs, and romantic lighting. And no grilled cheeses here, Tom Colicchio and 'wichcraft have designed a menu consisting of small cheese and charcuterie plates, along with sandwiches themed after the cities Southwest will be flying to out of LaGuardia. Will we have competition against the current Midtown soft shell crab sandwich to eat? We'll find out Friday. 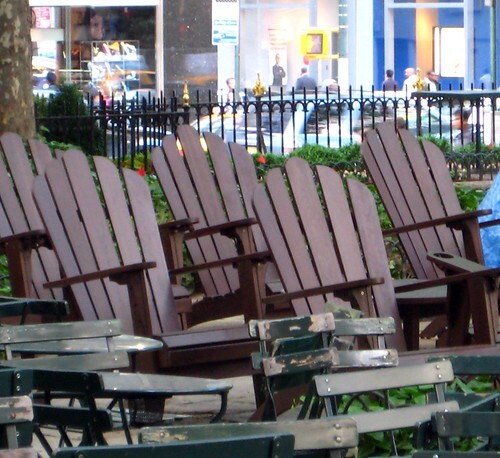 Until then I'll daydream about sitting in those chairs with Colicchio feeding me pieces of cheese, discussing his plans to get the fountain out of the way and it can become 'wichcraft Central. Well it's open! I tried out all the chairs but none of the food, b/c sadly there are no veggie sandwiches. Alas. The couch is certainly comfy.